From about 1985 John and Dora Dallwitz were making sand sculptures, sometimes on metropolitan, but usually remote beaches, not veiwable by the general public. The documentation of these works became the only remaining evidence of their existence. 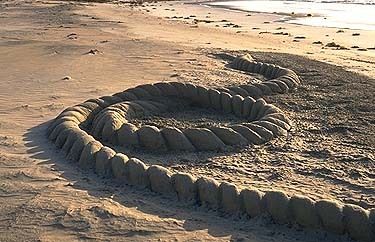 In 1994, with the help of other family members, they made their first rope sculpture on a beach at Ponadlowie Bay, SA. 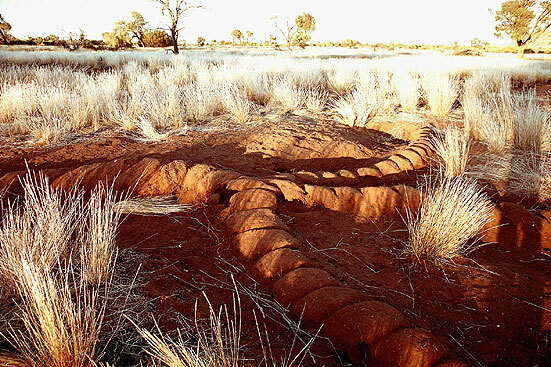 During the same year John and Dora travelled to the Pitjantjatjara Lands where Dora and two young Pitjantjatjara children, Sally and Ngumula Scales, built another rope sculpture in the red sand at Umuwa. Interestingly, quite independant of these works, under the creative influence of Bill Davis, the Pitjantjatjara people started developing their own meanings around the rope. 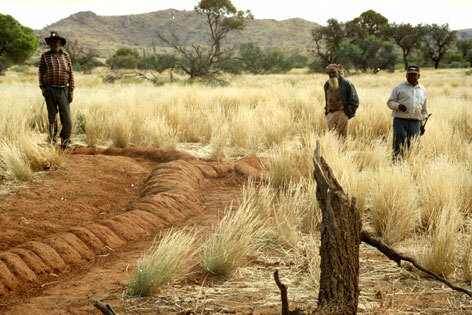 "A large peice of towrope was used as a tactile metaphor for culture maintenance during a series of community well-being songs and dance meetings called UPK2 across the Pitjantjatjara Lands in 1996. During the following years exponents of the rope story talked about spreading the word about the rope." Being a friend of many Pitjantjatjara people and interested in the development of their ideas about the rope and being struck by our own concurrent and independant use of the rope in sand sculptures, John Dallwitz showed Peter Nyaningu photographs of the early works which we had made. From that time onwards talk of a collaborative project started to spring up. "The rope story was used by Nganampa Health at young men's health meetings and at the Port Augusta gaol as an inspiration for the prisoner's rehabilitation. 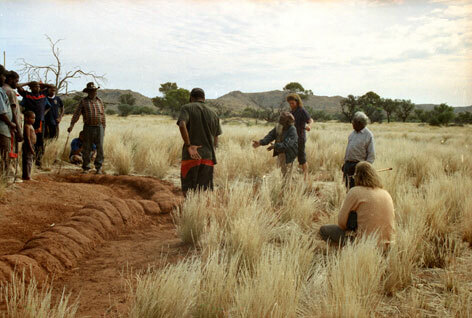 In May 2002, a group of youg Pitjantjatjara males, with Peter Nyaningu and Bernard Tjalkarin and others, took up the sand sculpture idea and built a thirty metre long rope on the banks of the Umuwa Creek. The effect was very powerful." Colin Koch, the Ku Arts co-ordinator saw the work at Umuwa creek and was moved to seek financial support to bring the concept to the outside world. Hence the Womadelaide 2003 collaborative performance.